This impressively large miniature was based on the 1776 portrait of ‘Lady Mills’ by Sir Joshua Reynolds (1723-1792). Although copies today are thought of as secondary to the original, in the case of artists such as Grimaldi their miniature interpretations were highly prized. Their purpose and appreciation were not confined to the skill of the copyist but they were highly regarded by the owners of the original oil and acted as a mutually useful tool for both artists. Reynolds saw great benefit in high-profile miniaturists publicising small versions of his oils, and in turn miniaturists benefited by association to the major society oil painters. There are several examples of Grimaldi’s large copies in the Royal Collection – many acquired at auction by members of the Royal family. Elizabeth Moffat was married to Sir Thomas Mills (d.1793), who eventually became a Governor of Quebec after serving in the army. The original portrait of Lady Mills by Reynolds remains in a private collection. The presumed pendant of her husband, who was painted by Reynolds on a number of occasions, is in the McCord Museum, Montréal. 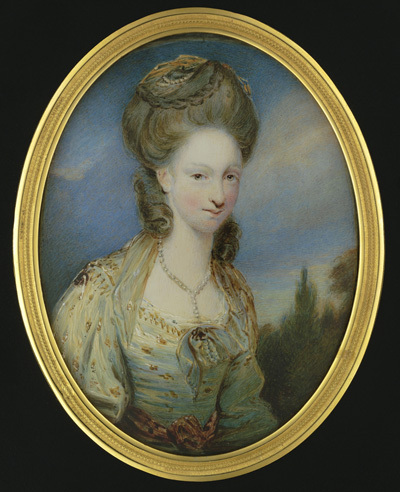 In his catalogue raisonné of Reynolds’ works, David Mannings  only tentatively suggests that the original portrait is of Elizabeth, Lady Mills. However further research has revealed that the sitter is certainly the wife of Sir Thomas Mills. Portraits described as ‘Sir Thomas Mills’ and ‘Lady Mills’ respectively were sold together at a sale at Christie’s in May 1810. Furthermore, Reynolds notes in his account books that a copy was made for a ‘Mr Moffat’, who was presumably the Elizabeth’s father. If Elizabeth was following her husband to his future career in Canada, it is quite possible that Grimaldi was commissioned to take a copy, in miniature, for the family left behind. Little is known of Elizabeth Mills. She bore at least one child, a daughter named after her mother (Catherine Creighton Mills) with her husband. Sir Thomas Mills led a controversial life both in England and Canada. After serving in Quebec and England, he returned to Canada in 1766 with appointments as receiver general, member of the Council, and brigade major. An influential and well-connected man, Thomas was ruthlessly ambitious. He enjoyed the patronage of Lord Mansfield and the friendship of Frederick Haldimand, hence perhaps his royal appointment as receiver general in 1765. He was clearly unfit for such a responsible position and displayed such arrogance and lack of integrity that he made many enemies. Saddled with the nickname ‘Corrupt Boy Mills’, he returned to London in 1767. His reputation in Canada did not prevent him from receiving a knighthood in 1772 and a new commission as receiver general in 1777. On his return to Canada, Mills continued to be prominent figure in society. This was of course an expensive business and he ran up huge debts, using £3000 of public money to appease his debtors. Once his illegal and unsavoury use of public money came to light he was sent back to London where he died insolvent in 1793. William Grimaldi was the son of the 7th Marquess Grimaldi and succeeded to the title, as 8th Marquess, in 1800. He was descended from the family of Grimaldi of Genŏa, the Merovingian Kings of France and the Princes of Monaco. He was therefore well placed to be appointed Miniature Painter in turn to the Duke and Duchess of York (1791), to George IV when Prince of Wales (1806) and then King (1824). He was trained by his uncle Thomas Worlidge and worked for several years in Paris (1777-83), although he exhibited regularly in London. Daphne Foskett, the art historian describes his miniatures as ‘of outstanding merit’. This miniature was traditionally described as being in the celebrated Walpole collection at Strawberry Hill. However, it appears from a 19th century inscription on the reverse that the sitter was previously thought to show Lady Hester Stanhope, the famous traveller. From the exotic nature of her dress it is easy to see why, however Hester Stanhope was born the year this miniature was painted.